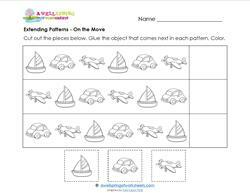 These extending patterns worksheets can do double duty and keep kids busy for a long time. Three of the pages are a cut and glue activity pages. Have kids say the patterns out loud for even more fun and so they can hear the pattern. “Frog, fish, worm, frog, fish, worm. The frog comes next!” In three of the worksheets children can examine the patterns and draw the shape that comes next. Then they can color the shapes in a pattern. 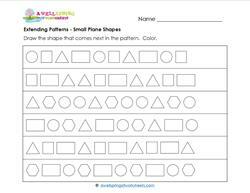 Please go to this page to choose from all the pattern worksheets on this site. 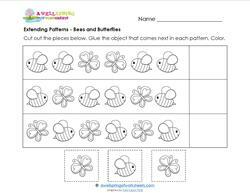 Extend the patterns of these cute insects by cutting and gluing the bee or butterfly that comes next in the pattern. Patterns are AB, ABC, and AABB. 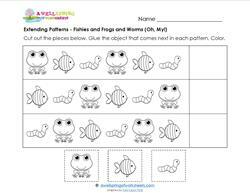 Cut and glue to extend the ABC patterns of the fishies, frogs, and worms in this extending patterns worksheet. Color when finished. Cut out the boat, car and plane and glue in the row that correctly extends the ABC pattern. Then take a minute to add some color! This extending patterns worksheet has ABC, ABCD, and ABCC patterns for your little ones to decipher. Draw the shape that comes next in the pattern. 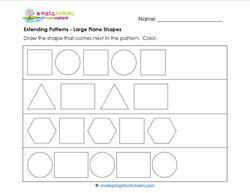 An extending patterns worksheet with ABC and ABBC patterns using squares, circles, triangles, rectangles, and hexagons. 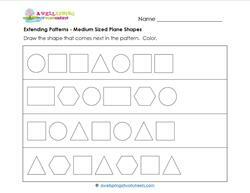 Extend the AB patterns in this worksheet by drawing the circle, square, rectangle or triangle that comes next in the pattern. Color.